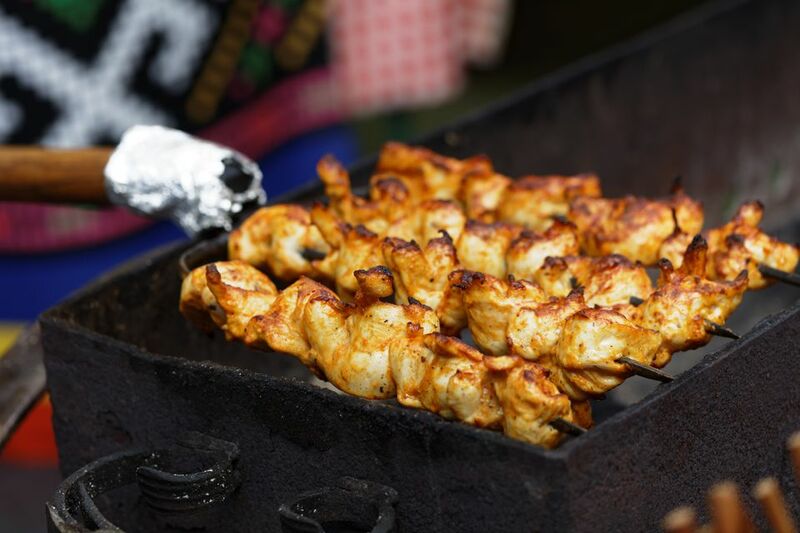 Kabobs were born over the open field fires of the soldiers of the Turkic tribes who used their swords to grill meat. This recipe for Romanian chicken kabobs/kebabs or frigarui is made with seasoned chicken only or a combination of chicken and veggies. Frigarui also can be made with pork or beef and sometimes bacon skewered with onions, peppers, tomatoes, and mushrooms, and then grilled. This popular Romanian street food is typically served with a garlic sauce known as mujdei de usturoi. As you might imagine, there are as many versions of this sauce as there are cooks in Romanian. In a plastic zip-top bag, combine 1 ounce mixed chopped herbs, 1/2 teaspoon pepper, juice of 1/2 lemon, 1 teaspoon sugar, 1/2 teaspoon ginger, 2 cloves crushed garlic and 3 ounces plain yogurt. Add chicken cubes, completely coating all the chicken pieces with marinade, and refrigerate, covered with plastic wrap, overnight or at least three hours. Cream the garlic with 1 teaspoon salt until it is of a paste consistency, either on a cutting board with a chef's knife or in a mortar and pestle. Put the garlic paste in a small bowl and add 2 tablespoons oil of choice. Beat with a fork or whisk until it is very well mixed and somewhat fluffy. This should take about 3 minutes. Add 1/2 cup sour cream and plenty of black pepper. Mix well. This Romanian garlic sauce goes well with any grilled meat or fish, French fries or baked potatoes, pizza or whatever your heart desires. Heat the grill. Thread chicken pieces on skewers that have been soaked in water for about an hour so they don't catch fire on the grill. Grill chicken kebabs on greased grates about 10 to 15 minutes or until done, turning several times while cooking. These can also be prepared on an indoor grill, under a broiler or in the oven. Serve with the mujjdei de usturoi.